Every parent’s question: What can I do to help my child be as happy and smart as possible? Finally, a clear answer is given in Amazing Minds, by parenting experts Jan Faull, MEd and Jennifer McLean Oliver, PhD. Faull has taught parent education, child development, and behavior guidance for over 25 years and she is known as the baby brain and clever toddler expert at BabyZone.com. Oliver is a cognitive psychologist and independent consultant who provides research and analysis of topics in cognitive science, including development and early learning. Both clearly know what they’re talking about in this book. Did you know that babies as young as one day old can differentiate your face form that of a stranger? Or that a six month old already knows what happens when moving objects collide with stationary ones therefore a simple game with ramps and balls can encourage learning at that age? This book is chocked full of information about early learning in babies and toddlers and comes complete with many great ideas to encourage learning at each age and even deals with appropriate discipline for younger children. As a mother and daycare provider, I really enjoyed this book. It was really nice to read about what makes our youngest family members “tick”. I particularly enjoyed learning about what their little brains are like as they develop and ways to nurture their ever-growing knowledge. I wish I had gotten to read this early, when my own children were babies and toddlers, but will definitely use what I’ve learned with my littlest daycare children. I think this is a must-read for any parent or people who work with children and it’s information is invaluable and could change your child’s life. 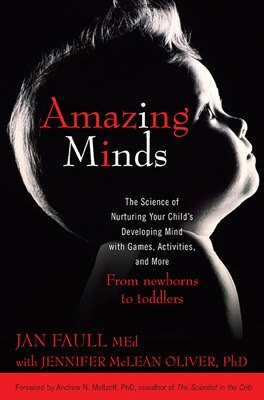 Amazing Minds: The Science of Nurturing Your Child's Developing Mind with Games, Activities, and More can be found in paperback on Penguin.com, Amazon.com, and at other major book retailers. Thank you to the Penguin Group for sending us a sample copy of this book free of charge to base this review upon.